Everyone has heard that eating spinach is good for you, but when you add it to your smoothies in the morning it will change your life! This is a spinach and fruit protein smoothie recipe that you will want to try. Everyone who gets totally immersed into the raw food diet phenomena or vegetarian lifestyle eventually discovers the power of greens in the morning, especially when it comes to smoothies. I for one am a huge maniac fanatic nut job when it comes to my morning greens in a glass, and have come up with some really great combinations that make me look forward to my breakfasts in a glass! But, I must confess that in all my exuberance, that I sometimes get so carried away in making my morning smoothie and making sure I put everything in it that I want, that I get forgetful of the basics. …like for instance, forgetting to put the top on the blender. Kids, don’t try this at home! 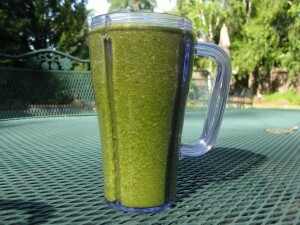 Blend thoroughly until spinach is fully processed in the water and it look like a dark green lagoon. Blend thoroughly until dark green lagoon lightens up and looks more lime green than dark green. Blend thoroughly and pour into tall glass… don’t dribble … especially if you tend to wear white t-shirts. Another great article David. thanks. I am learning so much from your newsletter and your mentorship. Only wanna comment on few general things, The website design and style is perfect, the articles is really fantastic :D.
OK! I am taking you up on the challenge!!!! Green mustache mania, here I come! I will probably be laughed out or my carpool this week because of my ‘green mustache’ BUT I bet you I won’t be falling asleep at my desk from the MacDonalds drive through that everyone else will be feeding at like trough! For all of you who are skeptics, this sounds worse than it really is! My kids love their green mustaches. Will be sending my green mustache ‘family’ picture in soon!!! LOVE THIS!!!!! Thanks for posting your recipe!!! I will be sending my ‘Green Mustache Club’ picture in shortly! This is a life saver – at least to my waste. Sure enough! Thirty days on your transition diet and using this as my morning meal has made an amazing difference – 4 INCHES DIFFERNCE!!!! Wow this is a great resource for health info. Especially love the smoothie recipe. Love this! You have something good going on here! I am excited to have found it! I am loving this web-site. Great articles and information. Love the mustaches! Why is it that in Brazil you can buy about $20.00 of fruit from the native Paw Paw tree which is widely known to block ATP production reducing the voltage of the cancer cell to the point it falls apart, i.e. apoptosis or programmed cell death?